1. Slice onion into quarters. 2. Cut bacon into halves. 3. Spray grill rack with nonstick cooking spray made for high heat. 4. Pre-heat outside grill on low or inside grill such as a George Foreman™ grill. 5. Prepare peppers by removing seeds from inside. 6. Cut long ways on one side of the pepper to split it open. 7. Cut chicken into 24 pieces, sized to fit inside peppers. 8. Stuff one chicken piece into each pepper. 9. It’s okay if some chicken remains outside the pepper. 10. Place one slice of onion on top of chicken to cover. 11. 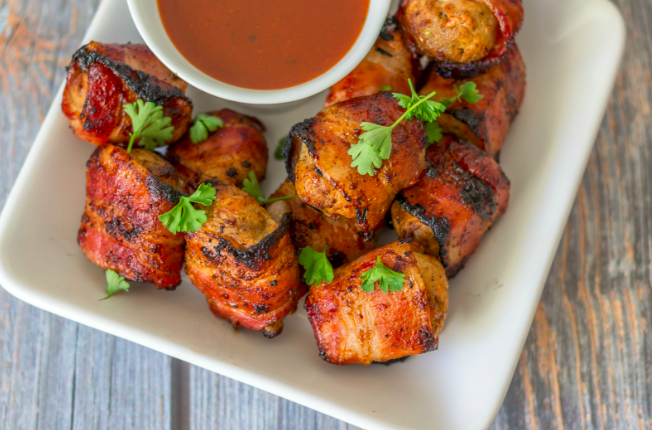 Take bacon and wrap around pepper/chicken/onion and secure with toothpicks. 12. Use several toothpicks inserted in different directions to secure. 14. Cook until bacon is crispy, approx 10 to 15 minutes. 15. Flip and rotate often to prevent flames from burning bacon as grease drips. Source: DaVita HealthCare Partners Inc.